Provide comfort for the family of Beulah Bates with a meaningful gesture of sympathy. Beulah was a member of the Shady Dell Primitive Baptist Church for 50 years. For most of her adult life she was a babysitter having cared for many children in Bourbon County. These children became a part of her family calling her, lovingly, “Aunt Boo” and stayed in touch with her through the years. She was also a “green thumb” growing many houseplants and lilies in her yard. She is survived by two sisters: Thelma Bates Stumph and Irene Bates (Bobby) Davis, both of Paris; three nephews, Thomas (Sherri) Stumph, Jr., Billy (Stephanie) Davis and Clay (Violet) Davis; four nieces, Janie Stumph (Larry) Martin, Connie Davis (Mac) Smith, Sandra Heflin (Ron) Logsdon and Julia Heflin (Dougie) McIlvain. Also surviving are several great and great-great nieces and nephews. Besides her parents, she was preceded in death by her sister, Betty Bates Heflin and two brothers, Woodrow Wilson Bates, Jr. and John Clay Bates. 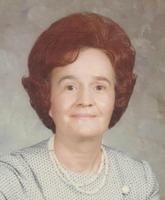 The funeral service for Beulah Christine Bates will be 1:00 p.m. on Thursday, March 21, 2019 at Hinton-Turner Funeral Home with Bro. Ryan Rawls officiating. Interment will follow in North Middletown Cemetery with casket bearers being Thomas Stumph, Jr., Mac Smith, Dougie McIlvain, Billy Davis, Larry Martin, and Ron Logsdon. The family request visitation after 11:00 a.m. prior to the service. To send flowers in memory of Beulah Christine Bates, please visit our Heartfelt Sympathies Store. Donations are being accepted for: HOSPICE OF THE BLUEGRASS INC.
We encourage you to share your most beloved memories of Beulah here, so that the family and other loved ones can always see it. You can upload cherished photographs, or share your favorite stories, and can even comment on those shared by others. Provide comfort for the family of Beulah Christine Bates by sending flowers. I have many fond memories of Beulah. I had the great pleasure of knowing her in my youth and keeping in touch throughout life. It saddens me on a deep level that she is no longer with us but she will be forever in our hearts. I wish I was able to attend the ceremony. I will visit the grave this weekend to pay my respects. My condolences to the family. I have lots fond memories of her from my youth and Young adulthood. I wish I was able to attend the ceremony but I'll have to visit the grave at a later date to pay my respects. Beulah came into our lives many years ago helping to care for our mother for two years. Her loving and caring ways were truly a blessing. She has remained one of our best friends that is more family than friend. Her thoughts were always of others and she loved her family very much. She had such a way of writing the most beautiful notes in a card, whether it was birthday, Christmas or a thank you. Always a smile and so glad to see you even near the end. Our lives were made much richer by knowing and loving this wonderful Christian lady.